From the end of Middle Ages Flanders maintained an active exchane between the Low Countries and the great centres of Italian art, so that it was not unnatural that at the close of the sixteenth century laces were known and made in Flanders. In one point Flanders was superior to other countries of Europe its linen, whereof the Flemish " exporte great quantity, and finer then any other part of Europe yealdeth. Spinning flax threads and weaving fine textiles is closely associated with the early commercial history of Flanders, and when the progress of manufactures was endangered by the religious persecutions of the sixteenth century, the linen trade alone is said to have upheld itself, and to have saved the country from ruin. The fineness of the thread used especially affected the lace designs when the early twisted and plaited merletti a piombini after the Italian models began to give way to scalloped laces in which flattened, broader tape-like lines forming some sort of floral ornament, were prominent. These date from about 1630 to 1660. Curved forms seem to have been found easy of execution in the bobbin lace, no doubt because (unlike Reticella) it was not constrained by a foundation of any sort. The immense quantity of bobbin lace produced in Flanders during the seventeenth century was aided by the improvements in spinning threads. BRUGES made bobbin lace in the late seventeenth and early eighteenth centuries, and the name of Bruges is given to a lace of a scrolling character. In Flanders a means was invented for producing laces of great width, which consisted of dividing the patterns not by bands, but into small and separate pieces, the boundaries of which coincided with the capricious curves of the ornament." Of this century is a bobbin-made lace a brides "point de Flandres," or "guipure de Flandres" as it is sometimes called. In this the pattern is composed of bold scrolling stems connected together by brides a picots. When the ground to lace of similar character and make consisted of small meshes, the lace was termed point d'Angleterre, and was made for the English market. 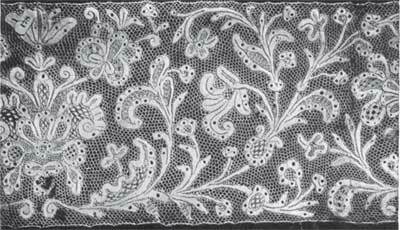 If a distinctive difference may be suggested between lace of the same style of pattern made in Flanders and Italy, it would perhaps appear to be in the quality of the thread. As has been said, the inhabitants of the Flemish provinces have always been noted for their superior skill in spinning and weaving linen, and from a difference in national taste, Italian lace is heavier and stouter than that produced in the north of Europe. The loose texture of this Flemish lace gives a pulled appearance to the outline, as if the brides were slightly straining it, and the pin-holes, from the same looseness, appear less precise in form than in the Italian work. Pillow-tape guipure is composed of a tape made on the pillow to follow the curves of the pattern, and connected by brides, generally plaited, also made on the pillow, or by "sewings." The braid follows the curves and lines of the pattern, and the various turns and curves are connected by means of sewings. The manner in which the braid is carried round the curves is extremely ingenious. By working partly across the braid and then returning to the outer edge of the curve a kind of wedge can be formed which brings the work round flat without any apparent thickening of the material. In the Flemish lace the fine thread obviated the necessity for the careful turning of the curves, and the method was gradually forgotten. Though we see less of the absolutely continuous line, patterns remained of a continuous scrolling character. The " sewing" (as now practised by Brussels lace workers) is formed by catching a thread through a pin-hole in an adjacent piece of braid, and passing another thread through the loop thus formed. In this way a pattern worked in separate narrow lines is all joined into a homogeneous whole. Sometimes instead of the braids being closely united, two threads are twisted, or four threads are plaited into a bride fastened with a sewing into a part of the pattern, and then carried back into the braid. In most of the pillow guipures the braid is lightened by holes or " bird's eyes," sometimes single, sometimes arranged in groups. 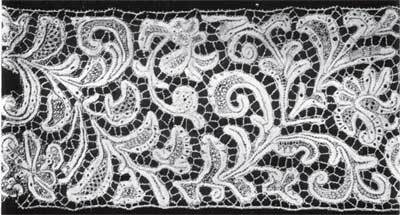 Sometimes a coarse quality of lace was made in which tape (not the tape made on the pillow) was used. The weaving of tape appears to have been begun in Flanders about the end of the sixteenth or the beginning of the seventeenth century. " Flat Spanish" or point de Flandres, is a pillow lace without any raised work. The lace was probably intended for Spanish consumption. 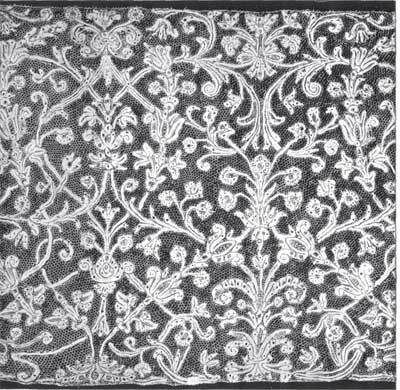 The pattern which consists of detached and fantastic cut-up forms of varying widths, sprays, ribbons, flowers,etc, lightened by many varieties of open work, grille, and veinings of pin-holes, shows often an architectural and balanced arrangement, A Flemish lace, straight-edged, with indeterminate pattern, and cloudy ground of irregular round circles with solid portions, is frequently met with. Its tradename is Binche.